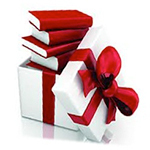 Give the gift of learning with a personalized gift certificate redeemable toward any noncredit course. Gift certificates are mailed directly to student. NOT Redeemable for CASH or CREDIT. Nontransferable and may not be sold or traded.